We are seeking dedicated Mustangs who are willing to become a major part of a new 501(c)(3) non-profit organization in specific roles (i.e. Fundraising, Marketing, Membership, Public Relations, Scholarship Endowment, Social Media, Technology, etc). If you are interested, please email us at tjhsalumni@gmail.com. We are seeking dedicated Mustangs who are willing to become a part of a new 501(c)(3) non-profit organization in a expert professional or consultant role. If you are interested, please email us at tjhsalumni@gmail.com. 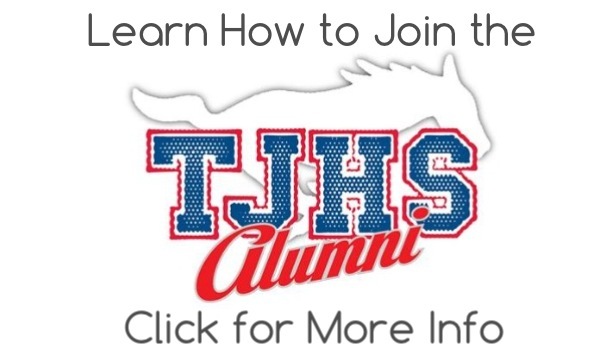 We are seeking dedicated Mustangs who are willing to volunteer 2-5 hours per month to represent the TJHS Alumni at class reunions, alumni fundraisers, sports tournaments or school-related events. If you are interested, please email us at tjhsalumni@gmail.com. We are seeking dedicated Mustangs who are willing to volunteer time to plan an Alumni Mixer, to be held in the Fall (Tommy Bowl or Alumni Game) and Spring (Fiesta Week). If you are interested, please email us at tjhsalumni@gmail.com. Alumni, we need your help! As Jeff begins a new school year, each school organization requires a teacher sponsor. Sometimes, these sponsors are not Jefferson Graduates and are unfamiliar with the student traditions or history of the school. Principal Vera has asked for our help to retrace history and document Mustang Pride and Tradition. We are looking for volunteers to form teams that can research the roots and evolution of their most beloved organizations, clubs, activities or traditions. Whether it is Lassos, Band or ROTC; the Hanye, Senate or MJR's; The Declaration, Speech and Debate Program or Academic Decathlon; or Football, Softball or any other activity, Principal Vera wants to pass these traditions onto the next generation of Mustangs. If you would like to volunteer for Project Share Our Traditions, please email us at tjhsalumni@gmail.com. Please include your name, class, phone number and student group(s) or traditions you would like to research. I'm ready to join and donate to the Thomas Jefferson High School Alumni Association.